For those that are not familiar with LuxePineapple, they are a beauty subscription company that has expanded their line by introducing a brand new subscription centered around products for the home. They also have an entire Pineapple Shop which features their own brand of cosmetics, exclusive items and products featured in their monthly boxes. Their new subscription box, LuxePineapple Home, features four or more finds for your home including decor, textiles, cleaning items and more! Let's take a look. Saro Ruffle Designer Throw | $39 | Just in time for this bitterly cold weather we're having! This throw is super cozy and gives any sofa or arm chair a decorative touch. I believe colors may vary and I received the Sea Green shade. I love the feminine detailing and fringe accents. It makes the perfect addition to my makeup room. Smart Sheep Wool Dryer Balls | $19.99 | Would I sound like a total mom if I said I've been wanting wool dryer balls for SO long? Well, needless to say I was especially excited to see these in LuxePineapple Home! 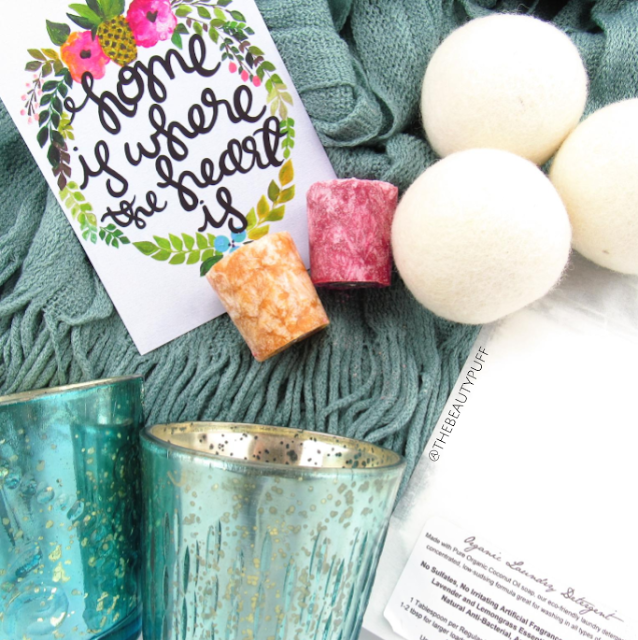 These dryer balls help fluff, dry and soften laundry without any chemicals. Just in time to wash all those winter coats and no more running to the store for dryer sheets. This mom approves. Unearth Melee Lavender Lemongrass Detergent | $5.50 | Another laundry must have included in this month's box is this natural, eco-friendly detergent. It contains no sulfates or artificial fragrances and is made with pure essential oils. *This particular size is exclusive to LuxePineapple Home. Mercury Glass Embossed Votive Holders | $18/set | Each LuxePineapple Home box includes a set of two votive holders. Each has one of four different embossed patterns on it. I love the size of these votive holders because, as LuxePineapple suggested, they're for more than just votives. At LuxePineapple they're used as planters. For me, these will be used as brush storage in my makeup room. They give the perfect pop of color! Lucias Candle Cottage Organic Palm Votives | $4/set | Votive holders wouldn't be complete without votives right? These two votives feature organic palm wax and natural cotton wicks. They will each burn for about 15 hours which is pretty impressive! These will look great out on display for the holidays. I love my candles! LuxePineapple Home subscriptions are $42/mo and ship every other month. This particular box had a retail value of almost $100! I love all the unique finds and thoughtful touches put into this box. Visit the LuxePineapple website below for more information and be sure to explore the Pineapple Shop!